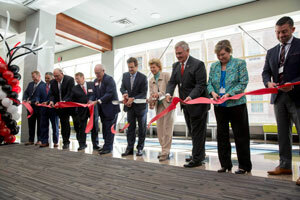 (VIDEO) The $15 million expansion adds more than 38,000 square feet to the existing building. As Texas Tech University continues to produce graduates who are some of the most well-equipped young leaders in today's workforce, the ability to continue that success in the business community took a prominent step forward Tuesday (Sept. 13). The Rawls College of Business unveiled its $15 million west wing expansion, adding 38,241 square feet of space for faculty and an ever-growing student population that is expected to reach 6,000 students by 2020. "We are excited to unveil this expansion, which will help the Rawls College of Business keep up with the continued growth and interests from students around the world," Interim Dean Paul R. Goebel said. "The new testing and research spaces as well as the other amenities will maintain the Rawls College's quest for excellence in preparing the next generation of business leaders." Designed by Parkhill, Smith and Cooper and built by Lee Lewis Construction – the original architect and builder for the Rawls College of Business building that opened in 2012 – the 42,901-square-foot addition matches the current building's design and includes four new classrooms, a third-floor behavioral research laboratory, a state-of-the-art testing center for student exams and a multipurpose space for events, guest speakers and student engagement. 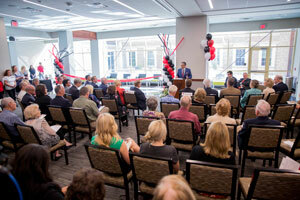 "This addition reflects the quality and growth in the educational community of the Rawls College of Business," Texas Tech President Lawrence Schovanec said. 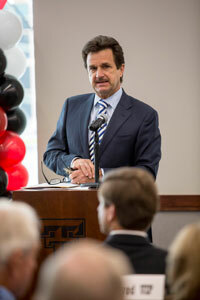 "This is attributed to the faculty and staff of the college, and also the alumni, such Jerry Rawls, whose commitment to Texas Tech advances the reputation of this college and the university." The expansion also will add more faculty and doctoral student offices, a new office for the study abroad program, private study rooms for students, a conference room for student organizations, seminar rooms for doctoral students, "think tank" rooms with white boards and an outdoor courtyard. The new wing also will feature artwork by Texas Tech alumnus Baron Batch as well as public art pieces by Glenna Goodacre and Koryn Rolstad. The Goodacre art piece, "CEO" was gifted to the Rawls College of Business as the noted artist announced her retirement last week. 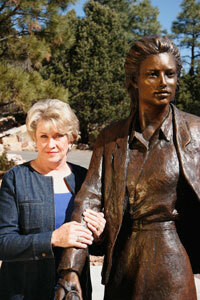 The sculpture is of Goodacre's daughter, Jill Goodacre Connick, who modeled for the piece in 1985. Goodacre has had a long relationship with Texas Tech, with many of her works appearing on campus. The largest piece is the towering standing statue of former Texas Gov. Preston Smith at the Administration Building. The most popular is "Park Place at Talkington Plaza" in front of the College of Human Sciences near the main entrance to the campus. A favorite among young visitors to the Museum of Texas Tech is "Tug O' War" at the front entrance to the museum. There also will be a Chick-fil-A eatery (opening in the spring) in the courtyard as well and entrance on the west side that will enhance the experience for visitors to that side of campus.